A wise mentor once exhorted me that the extent to which we fail to care for ourselves is directly proportionate to future limits on how we will be able to care successfully for those under our charge. In a 2014 study undertaken jointly by the American Medical Association and the Mayo Clinic, work/life balance and burnout were compared between 6,880 physicians and a probability sample of the general US population.1 The results indicated a notable decline in work/life balance experienced by physicians compared with previous results in 2011, with more than one-half of US physicians experiencing professional burnout. Staff burnout not only decreases satisfaction of health care professionals but also increases systematic costs and puts elderly patients at increased risk for less favorable outcomes. In light of 251,454 documented incidents of medical error, which ranks right after cancer and ahead of respiratory disease inpatient deaths, the magnitude of burnout effects becomes more evident.3 According to He et al, "The older population will exceed 21% in 94 countries," and some countries will experience quadrupling of the oldest segments of their populations by 2050.4 As the complex health-related demands of an aging society increase in an environment where many health care providers are already burned out, identification, treatment, and prevention of burnout remain important aims. Burnout is characterized by emotional exhaustion resulting in depersonalization and decreased personal accomplishment and satisfaction at work. Other symptoms might include fatigue, inability to complete work, decreased professional and personal satisfaction, poor work attendance, increased perceived significant problems, mood changes, and a host of other problems. Because we can't address what we fail to identify, regular personal and institutionally integrated evaluation of burnout is advisable. This is especially true considering the current proportion of medical professionals who are already experiencing burnout and the anticipated increases in demands on health professionals and health care systems as a result of a graying society. These geriatric population-specific stressors exist in addition to the already burdensome demands of regulatory compliance, electronic medical record implementation, and decreased reimbursement. With patient satisfaction directly tied to reimbursement, health care systems ought to increase efforts to systematically address burnout for staff and simultaneously patient satisfaction and reimbursement-related reasons. Whether or not larger systems address burnout appropriately, individuals, practice groups, and professional associations can begin this work. First published more than 25 years ago, the leading tool to measure burnout has been the Maslach Burnout Inventory, which uses three subcategories of measurement to assess for emotional exhaustion, depersonalization, and perceptions of personal accomplishment. Like the multifaceted medical problems our geriatric patients face, there is seldom a quick cure for each ailment. 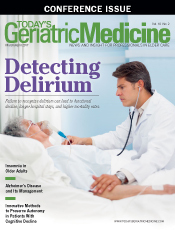 Further research into specific evidenced-based modalities of burnout treatment and prevention are crucial in the geriatric and general health care environment. In the current literature examined in the Westermann et al study, person-directed burnout interventions were found to have a positive effect for up to one month, work-directed interventions for one month to one year, and mixed approaches that combined person- and work-directed interventions also showed varied effectiveness. Of the 16 intervention studies evaluated, seven showed decreases in health care staff burnout. Three studies showed promising effects on patient outcomes. As the body of evidence continues to evolve, programs like Stanford University's Well MD initiative offer helpful physician resources such as self-assessment, self-help, and other tools to evaluate, treat, and prevent burnout. Emerging models of geriatric health care professional self-care maintenance serve an important role in today's geriatric medicine environment. — David Hage, MSW, LSW, C-ASWCM, is an assistant professor of social work and gerontology at Misericordia University in Dallas, Pennsylvania. He is also the cofounder of and a practicing geriatric care manager at Pathway Senior Care Associates. 1. Shanafelt TD, Hasan O, Dyrbye LN, et al. Changes in burnout and satisfaction with work-life balance in physicians and the general US working population between 2011 and 2014. Mayo Clin Proc. 2015;90(12):1600-1613. 2. Westermann C, Kozak A, Harling M, Nienhaus A. Burnout intervention studies for inpatient elderly care nursing staff: systematic literature review. Int J Nurs Stud. 2014;51(1):63-71. 3. Leading causes of death. Centers for Disease Control and Prevention website. https://www.cdc.gov/nchs/fastats/leading-causes-of-death.htm. Updated October 7, 2016. 4. He W, Goodkind D, Kowal P; United States Census Bureau. An aging world: 2015: international population reports. http://www.census.gov/content/dam/Census/library/publications/2016/demo/p95-16-1.pdf. Published March 2016. Accessed August 28, 2016.